KSA welcomed the Rangers Directors and interested sports enthusiasts to come out, socialize with others with similar interests and dine with Murray Hiebert. 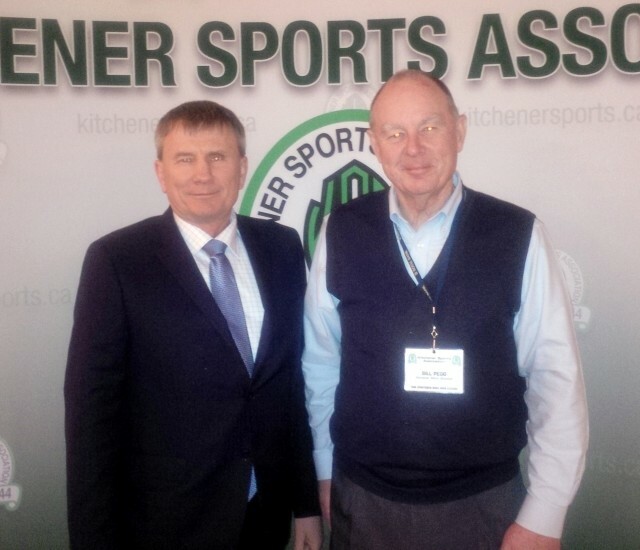 PHOTO: Murray Hiebert (General manager of the Kitchener Rangers) and Bill Pegg (President of the KSA). Murray joined the Rangers as a scout in 2001, and most recently served as the Rangers Director of Scouting. He has played a major role in player recruitment, and has been responsible for overseeing the Rangers’ OHL Priority Selection. Prior to his time with the Rangers, Murray was a scout for the Plymouth Whalers under former Rangers coaches Steve Spott and Pete DeBoer from 1998-2001. Murray also has served as a scout with the Waterloo Siskins, the London Knights, the Sudbury Wolves and with the expansion of the St. Michael’s Majors. Murray filled attendees in on the Rangers "business" and answered questions - even ones about the upcoming "playoff run." Always an interesting evening! Rick Weinstein (KSA Director in charge of the 50/50 draw) gave an update on the 50/50 draw. Fundraising success (sales) runs in tandem with the on-ice success of the Rangers. The implementation of a portable electronic sales/control system is still very much "up in the air" due to complicated licencing and regulatory requirements. A great meal and lots of discussion before, during and after dinner! You're invited to come out and socialize with other community-minded sports enthusiasts at any of our future dinners. Just let us know you're coming so we can make appropriate seating arrangements.